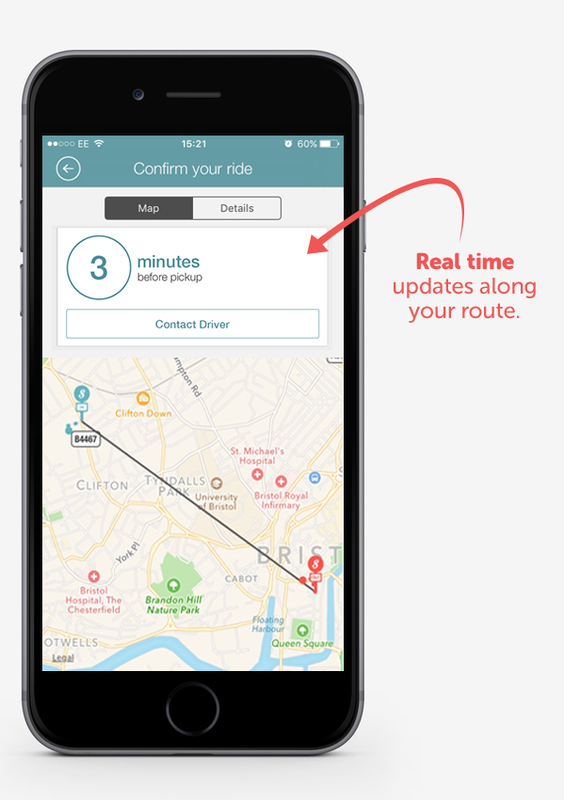 Get the app, then in a few taps, BOOK, WALK, RIDE. 26 November 2018 - RATP Dev, announces today the closure of its shared ride-to-work service Slide Bristol. Slide, launched in the city in July 2016 as a pilot project, has since made more than 40,000 passenger trips in one of the UK’s most congested cities. Slide is closing due to challenging conditions posed by Bristol’s infrastructure and competition from rapid transit routes. Coralie Triadou, Microtransit Director at RATP Dev, said: “Slide Bristol was the first microtransit service to be launched in the United Kingdom, and we are proud to have worked with the local community to provide this service to its commuters. Slide has proved to be extremely popular, covering more than 210,000 kilometers over a two-year period and receiving an average 4.9 out of 5 rating from customers for its drivers and service. “We are proud to have transformed what was initially planned as a short pilot project into a full two-year operation and remain committed to investing in microtransit services and in developing new creative transport solutions which benefit commuters throughout the UK and beyond. Founded in 2002, RATP Dev operates and maintains urban transportation systems in 14 countries on four continents (United Kingdom, France, Italy, Switzerland, Algeria, Morocco, South Africa, Saudi Arabia, Qatar, India, China, South Korea, the Philippines, and the United States of America). With more than 1.5 billion passengers travelling on its networks every year, RATP Dev demonstrates every day its extensive and renowned expertise in a wide range of mobility services, ranging from rail, regional express rail, tramway, to bus, cable car and sightseeing activities. RATP Dev leverages in France, outside of Paris, and across international markets, the technical expertise and experience of RATP Group, the leader in driverless and tramway operations and operator of the Paris network, one of the largest public transportation networks in the world. With sixteen million journeys every day across the planet, RATP Group is one of the leading urban transport operators in the world. The Group operates in fourteen countries on four continents through its RATP Dev subsidiary and each day runs eight modes of transport: metros, urban and inter-city bus services, tramways, rail, sightseeing, cable cars, maritime shuttle services and transport on demand. The Group is also present across the entire spectrum of new mobility services in partnership with four other modes (electric scooters, car-sharing, car-pooling and driverless shuttle services). As a widely-hailed expert in infrastructure management and engineering, the Group also fields a broad range of urban services through its subsidiaries in real estate management and engineering, operating retail facilities, fibre-optic technologies, customized passenger information and innovative ticketing solutions. RATP has been running one of the densest multimodal networks in the world for over seventy years in Paris and around the French capital. Thanks to its 61,000 staff members RATP Group designs, implements and runs mobility solutions and innovative services each day for sustainable and more human towns and cities. Slide Bristol is the original shared on demand commuting, celebrating our second birthday. So if you commute to work in Bristol by car, bus or train and are looking for a stress-free alternative then try Slide. Best in Bristol - our drivers consistently have 5 star ratings from our customers. Simply book your commute through the app for our affordable, fixed fares, use of the bus lanes and dynamic routes could save you both time and money! For greater savings add Slide credit, the more you buy the more you save or maybe a monthly pass is best for you.